two spoons of sugar スプーン 2 杯の砂糖. spoon up one's soup スープをさじですくう. The knives, forks and spoons were already on the table. She spooned up pudding into the baby's mouth. From Middle English spoon, spoune, spone, spon (“spoon, chip of wood”), from 古期英語 spōn (“sliver, chip of wood, shaving”), from Proto-Germanic *spēnuz (“chip, flake, shaving”), from Proto-Indo-European *speh₁- (“chip, shaving, log, length of wood”). Cognate with Scots spun, spon (“spoon, shingle”), Saterland Frisian Spoune (“chip; flake; splinter”), West Frisian spoen, Dutch spaan (“chip, flinders”), German Low German Spoon (“thin piece of wood, shaving”), German Span (“chip, flake, shaving”), Swedish spån (“chip, cutting”), Norwegian spon (“chip”), Faroese spónur (“wood chip; spoon”), Icelandic spánn, spónn, Ancient Greek σφήν (sphḗn, “wedge”). An implement for eating or serving; a scooped utensil whose long handle is straight, in contrast to a ladle. An implement for stirring food while being prepared; a wooden spoon. A measure that will fit into a spoon; a spoonful. (sports, archaic) A wooden-headed golf club with moderate loft, similar to the modern three wood. (fishing) A type of metal lure resembling the concave head of a table spoon. (dentistry, informal) A spoon excavator. (figuratively, slang, archaic) A simpleton, a spooney. 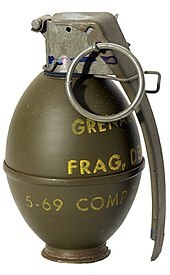 (US, military) A safety handle on a hand grenade, a trigger. To serve using a spoon. Sarah spooned some apple sauce onto her plate. (intransitive, dated) To flirt; to make advances; to court, to interact romantically or amorously. Do you think we spoon and do? We only talk. (transitive or intransitive, informal, of persons) To lie nestled front-to-back, following the contours of the bodies, in a manner reminiscent of stacked spoons. (tennis, golf, croquet) To hit (the ball) weakly, pushing it with a lifting motion, instead of striking with an audible knock. Rosol spurned the chance to finish off a shallow second serve by spooning into the net, and a wild forehand took the set to 5-4, with the native of Prerov required to hold his serve for victory. (intransitive) To fish with a concave spoon bait. (transitive) To catch by fishing with a concave spoon bait.